4th Annual International CCHS Day: November 10, 2018 - Avery Biomedical Devices, Inc.
CCHS Ties Us Together is the 2018 annual fund campaign for the CCHS Foundation & CCHS Family Network. We invite our CCHS community and supporters from around the globe to join us in #MovingTowardACure. What moves one forward better than a great pair of sneakers? The CCHS Foundation needs your help in gaining momentum and moving our community closer to a cure. 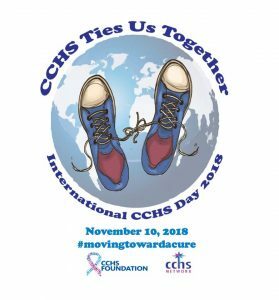 We encourage all CCHS families and friends to get in on the action by lacing up a pair of sneakers on November 10th with the shoestrings tied together. Take a picture as a sign of solidarity with the global CCHS community and post it to our CCHS Day Facebook page. Or feel free to “take it a step further” by getting creative with this theme (be sure to capture and share any funny moments)! Then, make a donation to the CCHS Foundation that equals the cost of your favorite sneaks. Think of every penny donated as one big step toward a cure!